I’ve been lucky enough to work as the editor of a show called Live From Abbey Road for the past 3-4 seasons, working with a great team of people and editing performances from some of the best musicians, bands and solo artists in the music industry. For me the best thing about being associated with this show in particular, is its global reach. The series has been broadcast in over 140 countries worldwide, has millions of views on YouTube, and is mentioned on a daily basis by people all over the world on Twitter, who are either watching re-runs or new episodes in their countries, or discovering old clips online. It makes me proud to know that as I sit here typing this in my edit suite, someone in Japan, Russia or South America is watching a show that I edited, and enjoying it enough to tweet about it. Essential to the style of how we edit the show is establishing Abbey Road Studios as the venue, beyond the standard establishing shots you see in other programmes. The name “Abbey Road”, the white studio building, the graffiti-covered wall, the crossing and Studio 2 have all become iconic images synonymous with the history of British music, primarily through association with The Beatles. So in the show we attempt to reflect the fact that this building in St John’s Wood has become more than just an icon of British culture, but somehow now belongs to the world, visited daily by tourists and music lovers from far afield. Now obviously we have filmed hundreds of shots of people walking across that famous pelican crossing and signing the wall, but we always strive to use the moments that are unique, funny or surprising. We’ve had shots of people nearly getting run over, naked people, people back-flipping and cartwheeling their way across and people in costumes and fancy dress. The key is if you’re visiting, be original. Doing the four person pose (one in barefeet) a la the Abbey Road album cover isn’t going to cut it anymore. Think how many people have done that. Why come all this way to be predictable? So we’ve been lucky enough to have some lovely improvised moments which make us laugh and have found their way in to the edits of the shows. And when I’m cutting these shots in, I sometimes wonder if the person on camera, somewhere many thousands of miles away by now, will ever see themselves goofing around outside Abbey Road, and proudly show all their friends on Facebook and Twitter. And then it happened. Last week an email arrived in my inbox from Brazil, via the contact form on my website. At first I thought it was more spam – all I seem to get from that bloody contact form is invites from potential Russian brides or Canadian Pharmacies trying to sell me Viagra. But this was different. It was from a gentleman from Curitiba, Brazil called Diogo Raizer Barbosa, proudly announcing, “that’s me in the beginning of the video of Ryan Adams” and including a link to the corresponding photo on Facebook. And so it was. 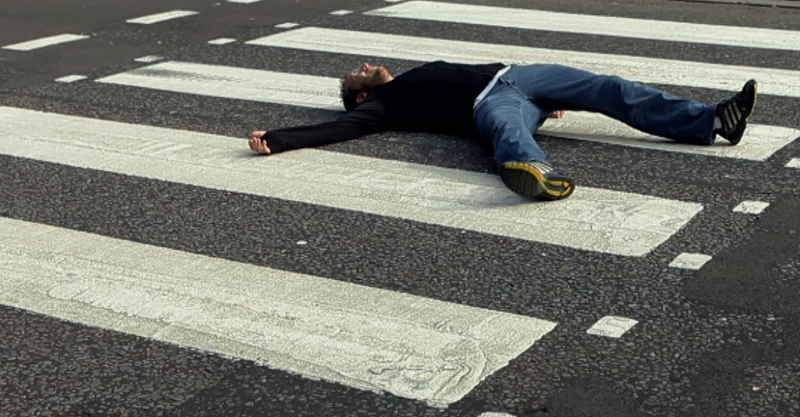 Diogo was fooling around lying down on the crossing, much to the local driver’s discontent, and it provided a funny moment to open our best show from series 4, featuring Ryan Adams and Laura Marling. It’s one of my favourite moments from the series, so much so that I’ve used the image on my website. I hope now he’s tracked me down he’s not after image rights. I have since sent a link of the episode to Diogo, which he has in turn posted on Facebook with the words “For those who doubted it was me in the picture …” Here’s to you Diogo, for coming all the way from Brazil and being original.